Our 47,000+ indoor cyclers get the calorie burning benefits of an indoor cycling class in the comfort of their home! They avoid the inconvenient trip the gym and don’t pay for expensive “studio” classes. Recently FEATURED on the Today Show and CNET.com! Problem 1) Going to a gym class can be inconvenient and time-consuming for working adults. Problem 2) Studio Indoor Cycling Classes or specialized fitness classes are extremely expensive. GCC was designed for busy professionals who need to be flexible and want the benefits of a personalized indoor cycling class. We offer a complete range of CYCLING, BODYWEIGHT TRAINING, and YOGA classes, which you can download and use whenever you want, an UNLIMITED amount of times and from wherever you want. Our goal is to bring you world-class instruction from a variety of cycle coaches, yogis, and personal trainers from around the world. Whether you're a novice or a fitness fanatic, you can benefit from taking the classes in Global Cycle Coach. The classes vary in intensity level and length--ranging from 10-minute targeted muscle toning activities to 60-minute endurance workouts. We love to hear from you (our users), so if you have any comments or questions, please don't hesitate to contact us by email or post on our Facebook page! - First Rate Classes include cycling, yoga, and bodyweight training. 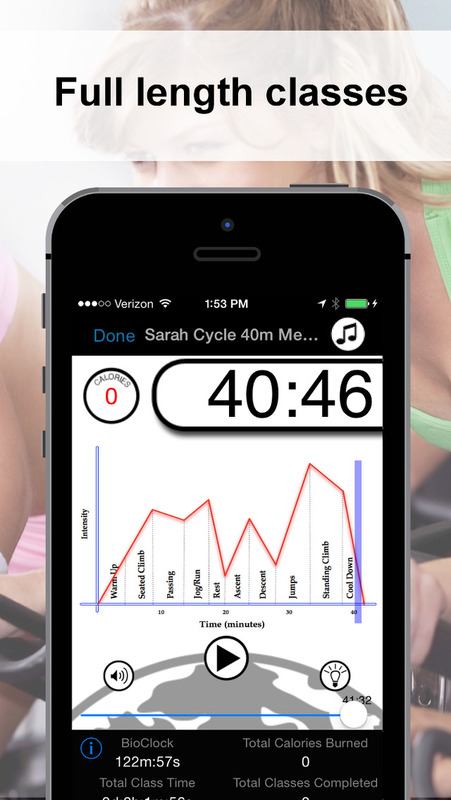 - CUSTOMIZABLE workout length: classes range from 10 minutes to 60 minutes. - Select your INTENSITY level: classes range from beginner to Intermediate to Advanced. - CHOOSE your own music (or use your favorite internet radio station, like Pandora), or you can use the coach's pre-selected songs. - You can start as a beginner (a "Learn the Basics" section helps get set up with the cycle and yoga fundamentals), or you can start at an advanced level: there's something for everyone! IMPORTANT: Once you purchase a class once, listen to it an UNLIMITED amount of times. You have it to use any time, all the time, forever (even if you uninstall and reinstall the app)! Small bug fix, now yoga classes images will change as before.